Hello Denver! I felt that I needed to write a post about the basic anatomy of the skin so that you could have a deeper understanding of things I reference in other posts. The registered nurse in me also just loves anatomy, physiology and educating. So here is a very basic guide to simple skin anatomy. The skin and its parts is called the integumentary system. It is the largest organ in your body. The average person's skin weighs around 10% of your body weight and has a surface area of about 20 square feet. There are three major layers you need to think about and both of these layers break down into sublayers. The outer layer called the epidermis and the inner layer called the dermis and the lower layer is the hypodermis aka subcutis. Lets start with the epidermis. The epidermis and dermis layers then each break down into further sublayers. The epidermis provides protection from the outside world invading your body. It also regulates how much water is being released from the body (sweat). This layer has no blood supply and is made up of 90% keratinocytes. Keratinocytes are basically your dead skin cells. They are born in the bottom layer (Stratum Basale) of the epidermis and over 4-8 weeks they flatten out, travel to the surface, and flake off. Lets start with the sublayers of the epidermis. Stratum Corneum- This layer is composed of the many dead skin cells (corneocytes) that you flake off into the world. This layer protects and helps to repel water. Stratum Lucidum- Is know as thick skin and is only present on palms of the hands, fingertips, and the soles of the feet. Stratum Granulosum- Here is where keratin production occurs. Keratin is a protein that is the main component of skin. This is also where keratinocytes flatten out and contribute to your natural moisture factor. It also forms a oil layer that moisturizes and protects. Stratum Spinosum- This layer gives the skin strength as well as flexibility. Contains free proteins, immune cells as well as much of your skins natural hyaluronic acid. Stratum Basale- This is where the skin cells, called keratinocytes, are formed before moving up through all the layer and eventually flaking off in the stratum corneum layer. This is also where melanocytes are located. Melanocytes are the skin cells that produce dark pigment. They give skin color, produce the color of freckles and tans. Melanoma is cancer of these cells. 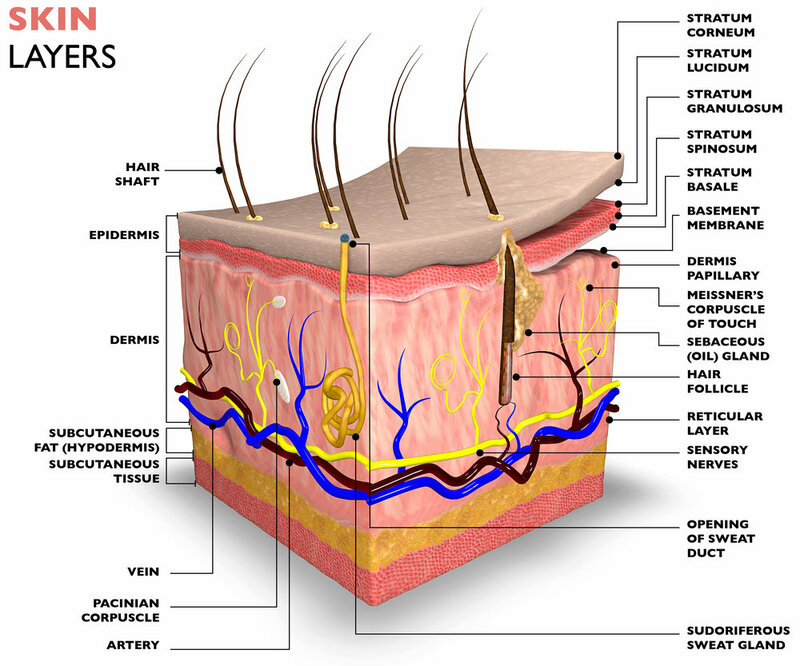 The dermis is the skin layer below the epidermis and before your fatty layer or the hypodermis. The dermis is where collagen, elastin, and extrafibrillar matrix live. These are important structures in aesthetics. Other important structures also reside in the dermis including blood vessels, nerves, thermoreceptor, pain receptors, glands and hair follicles. Papillary Dermis- This layer contains fine collagen and blood vessels. Reticular Dermis- In this layer the collagen is denser and there is dense connective tissue. Skin strength, elasticity and extensibility is a result of these connective tissues and collagen. Most other skin structures live here as well, glads, nerves, hair follicles and so on. Dermal Papillae- this layer supports the dermis layers and is what forms finger prints and ridges. It also nourishes the other layers of the dermis. Lastly the subcutis or hypodermis. For our purposes, will not discuss this layer much. What you need to know is that this is basically the protective fat layer below and connected to the skin. There is lymph here to help fight infection. It also provides a heat layer. So that is it, a very quick basic rundown of the skin. Hope this helps with your understanding of one of the most important systems in your entire body. I will leave you with this....If you change your dermis, you will change the appearance of your skin! Newer PostHarness The Power Of Your Body's Natural Moisturizer For Young, Supple Skin!